It’s cold and rainy again, calling for lows tonight in the mid 30s and gusts of wind as strong as 20 mph! 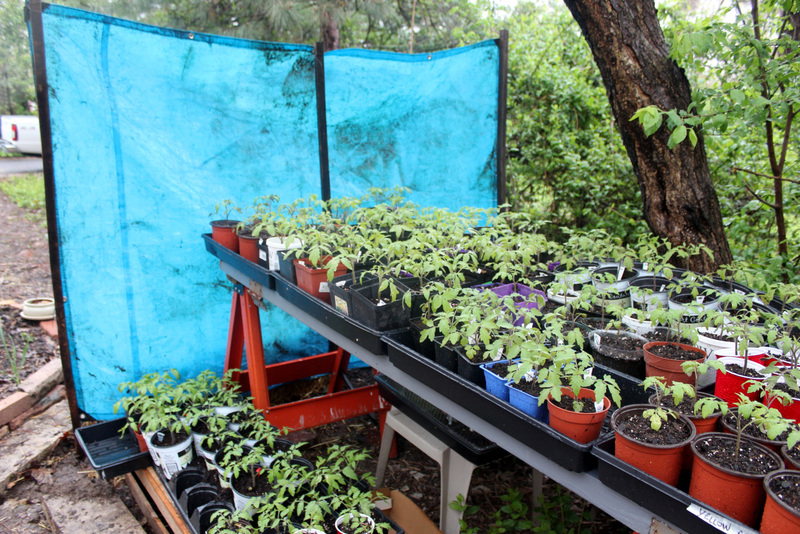 So we’re doing our best to protect our tomato plants, both in ground and in pots. 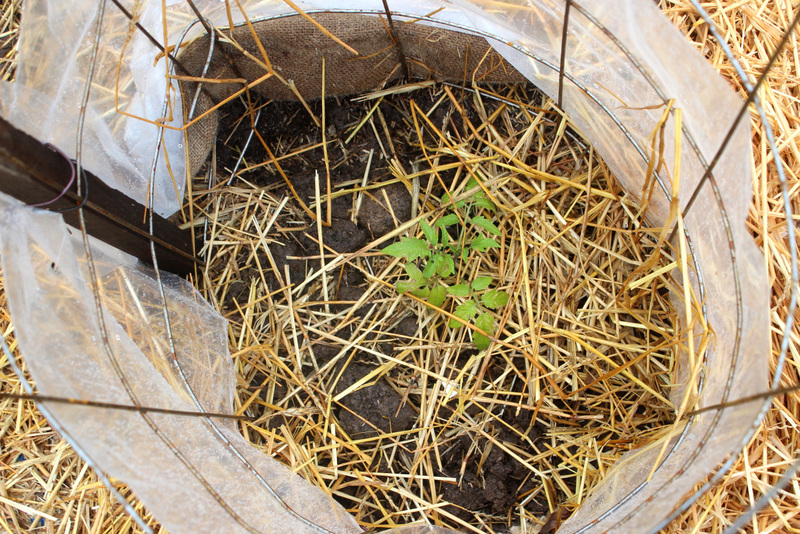 This morning I went out to Sunset Hills to protect our newly-planted tomatoes. It gets colder out there in the county than it does in the city. Thankfully, Eric’s mom was willing to help me in the rain! 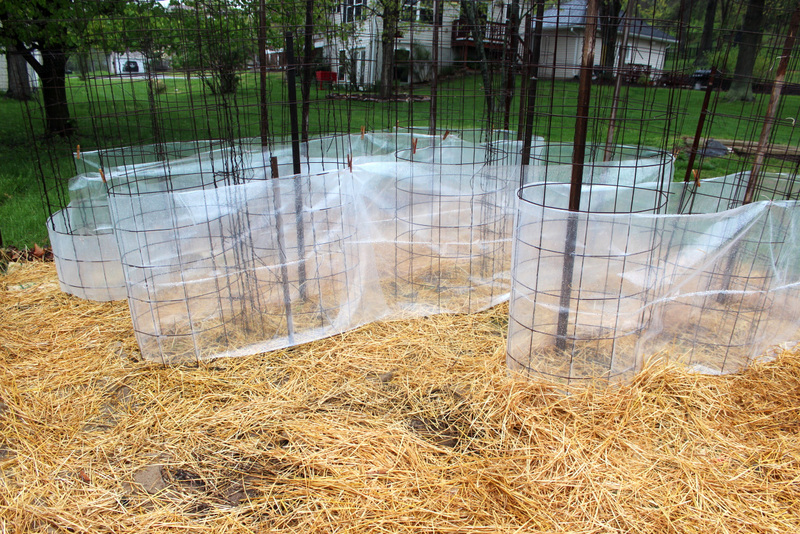 We wrapped plastic sheeting around all of the tomato cages and secured it with staples, clothespins, and wire. I don’t think we’ll get any frost but we wanted to be extra safe. Along with the straw, the plastic should be a good wind break and provide more insulation. We’ll just have to remove the plastic on Thursday before it gets too warm! Here at home, Eric helped me build a windbreak for the potted tomato plants. Most of our plants are safe and sound inside our half hoop house but many are outside hardening off. This tarp attached to wooden stakes driven deep in the ground should protect these babies from strong gusts of wind. On a side note, we’re now selling our tomato plants! All organic, many heirloom varieties including Arkansas Traveler, Costuloto Genovese (our favorite), a bush Beefsteak variety, all colors of cherry tomatoes, and several others. In 3″ or 4″ pots, $3 each. Let us know if you’d like any! Edit: We only sell locally in the St. Louis area. We are not able to ship plants at this time. Thanks for understanding!